REV Recreation Group answers America's pioneering spirit with seven luxury RV manufacturers. Together, Fleetwood RV, Holiday Rambler, Monaco Coach, American Coach, and Midwest Automotive Designs deliver the best Class B motorhomes, high-end Class C motorhomes, and luxury Class A motorhomes. Meanwhile, Renegade RV provides travelers with custom motor coaches, sportdecks, and stacker trailers. 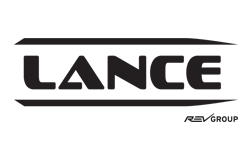 Covering your non-motorized needs, Lance is proud to provide REV customers with travel trailers, toy haulers, and their iconic truck camper lineup. American Coach features a luxury lineup that sets the bar in modern motorhome design. This brand combines the sleek styling of a luxury car with the undeniable comforts of a luxury home in a Class A motor coach. With more motorhomes on the road today than any other manufacturer, Fleetwood prides itself on building dependable products, like Discovery and Bounder, which connect families one journey at a time. More than just a Class A motorhome, Monaco Coach is a preeminent brand that has dominated the luxury market for five decades thanks to unparalleled performance and impeccable accommodations. Holiday Rambler focuses on the idea of home — not the place, but the feeling — to turn RVing into a dream lifestyle. In short, the motorhome manufacturer has been creating dream getaways since 1953. When Renegade RV was banned from an RVIA convention because the company wasn’t a member, it set up shop outside, calling itself the Renegades. The name stuck. Today, the brand features industry-defying motor coaches, toterhomes, stacker trailers and more. The most respected name in Sprinter Van custom conversions, Midwest Automotive Designs builds and “upfits” luxury vans praised for their quality, comfort, and durability, using an artistry unmatched in the industry. Since 1965, Lance has been building America’s most popular truck campers. Now, the “Quality Comes First” manufacturer is bringing ultra-light travel trailers and uncompromising toy haulers to the market. REV’S world-class manufacturing facilities span the United States, covering more than 4 million sq. ft. of space. Located in Decatur, Elkhart, and Bristol, Indiana, as well as Lancaster, California, REV’s efficient manufacturing footprint focuses on operational excellence at its American Coach, Monaco Coach, Holiday Rambler, Fleetwood RV, Renegade RV, Midwest Automotive Designs, and Lance facilities. Fueling America’s sense of adventure: Manufacturing “Vehicles for life,” the REV Recreation Group takes enormous pride in “connecting” people. With a REV RV serving as the vehicle for adventure, families and friends can create a lifetime of cherished memories. A commitment to innovation: Collaborating with the same designers who work with Ferrari, Maserati, and Bentley, the REV Recreation Group continually pushes the luxury RV category forward with a fierce commitment to innovation. Our American-made stamp: The REV Recreation Group is proud to employ a long list of American veterans (more than 200 employees!) with each putting their American-made stamp on these luxury RVs in REV’s Indiana and California manufacturing facilities. REV’s commitment to service: Millions of lives depend on the safety and reliability of our vehicles. With four regional technical centers, each strategically located throughout the country, and a network of trusted dealers, REV is at the ready to stand behind its motor coaches, travel trailers, and stacker trailers.